Our website address is: http://www.makeadlib.com. All blog content is for entertainment purposes only. Any nutrition or health advice posted on Make Ad Lib is not meant to treat or cure any medical condition or disease. Always consult with your doctor about your personal health and wellness. 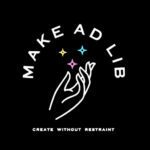 The content on Make Ad Lib, including the photos, recipes, and logos is the property of Libby Baker. Social sharing is great, and I encourage you to utilize social media to repost, as long as you link back to this site and give full credit to Make Ad Lib. All images, recipes, and content is Copyright 2018, unless otherwise noted. In order to keep this blog running and pay for supplies, I participate in affiliate programs, and accept advertising that generates income for the blog. Some of the links on Make Ad Lib are affiliate links. This means that if you purchase a product through a link I have provided, I will get a small commission for the sale. I will not endorse anything that I do not believe is a quality product, however, I hold no responsibility for the quality of the product or service you will receive. You do not pay more by purchasing through these links, nor do I receive any information regarding your purchase. I am a part of advertising networks. As such, I am able to select the categories of the ads displayed, but claim no responsibility over the products or advertising displayed. Please contact me if you find any advertising offensive and I will have it removed. We accept payments through PayPal as well as the Stripe App, which allows for credit card payments. When processing payments, some of your data will be passed to PayPal or Stripe, including information required to process or support the payment, such as the purchase total and billing information.